A monument, building or site is considered as a world heritage site, by the UNESCO when there is a threat of destruction not only due to natural causes but also by changing social and economic conditions. Such designated places have outstanding interest and therefore a need to preserve them becomes a cause of utmost importance. One of the prominent World heritage site in India is Hampi, which is located in the Hospet taluk of Ballary district in the southern state of Karnataka. Hampi is also referred to as the group of monuments at Hampi, was the capital of the Vijayanagar empire in the 14th century. The village in the earliest references was known as Pampa Kshetra or Kishkinda Kshetra (it is noteworthy to mention here that this place was mentioned in the Ramayana as to the place where Rama and Lakshmana met Hanuman, Sugriva and the monkey in their search for Sita). The name was derived from the old name of the Tungabhadra river which was then known as the Pampa river, hence the name Hampi which is the anglicized version of the Kannada, Hampe. It became the centre of the Hindu Vijayanagar Empire capital in the 14th century flourishing in trading, intellectual pursuits, and arts and with a strong military base. The rulers of the Vijayanagar empire invested in roads, public infrastructure, agriculture, waterworks, etc making it the richest area in India and second in the world only to Beijing. Chronicles written by the Persian and European travellers talk about an extremely prosperous and wealthy city on the banks of the Tungabhadra river, with numerous temples, farms and trading markets. In 1565, at the Battle of Talikota, a coalition of Muslim sultanates entered into a war and defeated the King of the Vijayanagar Empire and beheaded him. This was followed by a massive destruction of the infrastructure. The city was looted and burnt for six months following the war, after which the city was abandoned as ruins and remained ignored till the mid 19th century. The ruins of Hampi are spread over 4100 hectares and has several forts, temples, shrines, royal and sacred complexes, mandapas and many more architectural marvels. Hampi continued to be hailed as a religious centre because of the presence of the Virupaksha Temple, a temple dedicated to Lord Shiva. 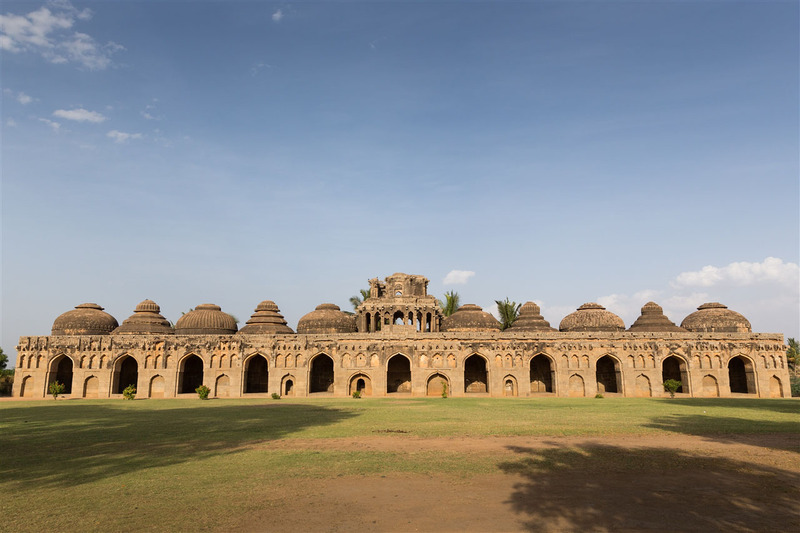 Today Hampi is hailed as a major tourist destination, read here to find out about the other sights in and around Hampi, and the happenings here to understand its growing popularity. The temple is dedicated to Lord Shiva, consort of the local Goddess Pampa Devi. The temple is about 1300 years old and has remained functional uninterruptedly making it one of the oldest functional temples in the country. Originally it was a small shrine which was present even before the foundation to the Vijayanagar Empire, which they then converted into a large temple complex. The Ranga Mandapa or the centre pillared hall is the most ornate part of the temple which was added to the temple complex by Krishnadevaraya in 1510 AD. The temple is carved in stone and the walls, panels, pillars and columns have beautiful carvings depicting various aspects of Shiva’s life, scenes from the Ramayana and Mahabharata, and Krishna’s childhood. It is said that during Shiva’s wedding with Pampa, the heavens showered gold on the couple and the place where it happened is Hemakuta. Here lies a collection of moderately sized monuments that are the best preserved in the Hampi region. The temples are dedicated to Shiva, Parvati and Ganesha. This temple is situated along the Tungabhadra river and to the north eastern part of Hampi. This renowned temple dates back to the 15th century and was built by King Devaraya II. The temple is dedicated to Lord Vitthala, an incarnation of Lord Vishnu. The elaborate and artistic carvings of this temple are unparalleled to any other temple in Hampi. The temple complex is a sprawling structure surrounded high compound walls and three towering gateways. There are many halls, shrines and pavilions inside the temple complex, each a work of art in its own right. The main attractions of the Vitthala temple include the Maha Mantapa, Ranga Mantapa, Utsava Mantapa and the famous Stone Chariot. This is the largest statue in Hampi depicting Lord Narasimha Swamy in a terrifying form. The Narasimha form of Lord Vishnu is half man- half lion. This monolithic structure is 6.7m in height and has the deity sitting in a cross legged position on the coil of an extremely large seven headed snake, Adisesha. According to history, the original structure had Goddess Lakshmi seated on the lap of the lord but was vandalized and damaged extensively in 1565 and can now be seen in the Kamalapura Museum. The floor around the statue shows a carbon stained floor which clearly indicates an attempt to burn down the entire structure. 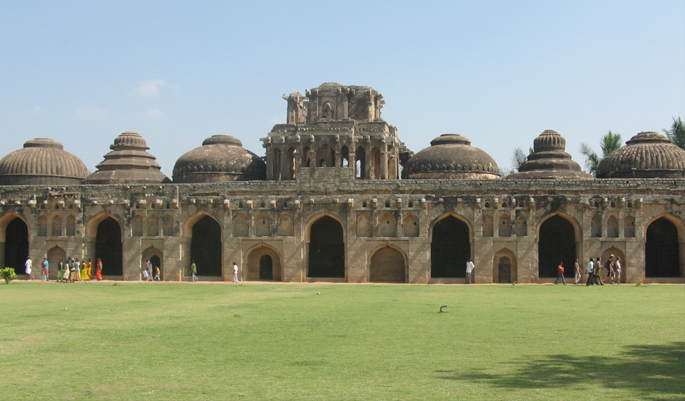 It is one of the least damaged structures in Hampi and a popular spot for visitors. As the name suggests it is the place used to park elephants. It is a long building with a row of eleven domed chambers, which is eleven square chambers aligned north – south. The opening of the chambers are arched and the chambers have an alternating plain and fluted domes. In the middle of the stable are stairs to reach the terrace. The square water pavilion or Queen’s bath is to the south east of the Royal Centre. Although known as Queen’s bath it was a common bathing area for men and weary travellers. Water bodies are well designed to carry fresh water into the tanks and wash water and overflows away from it. Many of the water bodies had aqueducts to carry water to tanks and other parts of the city as well as drains and channels to handle any overflow. This is not all, there are several other must sees in Hampi such as the Krishna Temple, Achyutaraya Temple, the Hazara Rama Temple, Kodandarama Temple, Pattabhirama Temple Complex, Zenana enclosure and so on. Many of these structures and temples bear evidence of extreme damage and pillage and several attempts have been made by the Government to restore these beautiful pieces of architecture. The nearest International airport is Bangalore which is about 350 Km away whereas the nearest domestic airport is at Ballary a mere 60 Km away. Taxi services are available from both airports. The railway station closest to Hampi is at Hospet which is about 13 Km from Hampi. Thirty trains from several major cities including Bengaluru, Hubli, Goa, Kolkata, Ajmer, Vijayawada, etc stop at Hospet. Hampi is well connected to various major cities by road as well. The drive to Hampi is an interesting option since there are many sights and places of interest along the way there. Best months to visit Hampi? Winter touches Hampi between October and February making it the best time to visit the place. Besides the fact that the afternoons during these months can be quite warm, the rest of the day is rather pleasant and makes it ideal to look around. The greenery left behind by the monsoon season gone by makes the entire place green and appealing. It is also a good time to go on a cruise along the Tungabhadra river, since there is a decent amount of water and the flow of water is smooth. The ancient Vijay Utsav festival is celebrated in November. The highlights of the festival include folk music, dance and art. The Purandara Festival is held sometime in January/February and is a classical music festival. Summer covers the months from April to July. The weather is rather arid and exploring Hampi during these months is not recommended. However the Virupaksha Car Festival is held in the month of March/April. Monsoon lasts from July through September. The amount of rainfall is low to moderate and keeps the surroundings lush and green. It is a beautiful time to explore Hampi around this time of the year, however the boulders and rocks tend to get slippery. Rock climbing is definitely not advised in this season as is taking the ferry at the Tungabhadra River. As with any tourist destination, Hampi has several choices for places to stay…… Accommodation ranges from top end hotels to the moderately priced ones depending on one’s budget. In addition there are resorts, homestays and even camping sites for the more adventurous. – About 13km from the City Centre, is the Daroji Bear Sanctuary which is home to about 120 sloth bears, jackals, leopards and wild boars. – The Anjaneya Hill is about 4km from the city centre and houses the Hanuman Temple. A climb of 570 steps to reach the temple also gives a breathtaking view of the scenery. – Rock Climbing is a favourite activity around Hampi. There are granite craigs and boulders all round which make it an ideal spot for the activity. – Going for a ride along the Tungabhadra in a coracle is an experience which one doesn’t get in many places in the country. – Cliff jumping is another adrenaline rush for the bravehearts. Ofcourse one must steer clear of places known for crocodiles…There are designated safe spots for the activity. – A 2 hour drive from Hampi is Badami, which is located in a ravine at the foot of a rugged red sandstone surrounding the Agastya lake. The Badami cave temples are a complex of four Hindu, a Jain and possibly a Buddhist temple. These caves temples are about 10 centuries old than the Hampi temples and have not held up very well. Planning a trip to the heritage site requires a good 3-4 days to comfortably cover all the places there are to visit in and around Hampi. 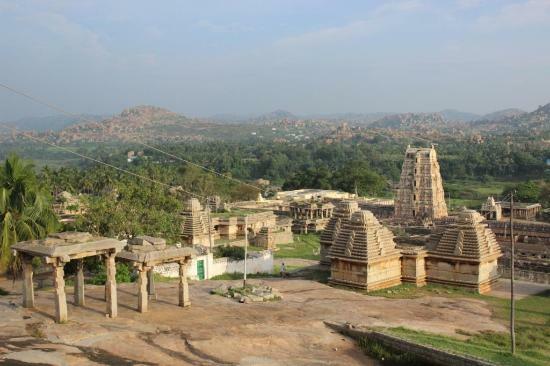 If you are still dragging your feet about making the trip to Hampi, it would help to know that Hampi has been voted the second, in the list of 52 places to go to in 2019, published by the New York Times. A panel consisting of the top 5 influential travel bloggers of the world has voted Hampi as one of the top emerging Asian Travel Destinations of 2019. Which are the top things to do in Hampi according to you? Let us know in the comments section! Also Read - 10 Best places to visit in Northeast India in 2019!